This standard defines a naming and addressing scheme for videoconferencing endpoints on the Connected Health network. HISO 10049 is the published standard for videoconferencing interoperability, supporting telehealth services and interoffice communication. This second part of the standard, developed by the New Zealand Telehealth Forum’s videoconferencing working group, provides a naming and addressing scheme for videoconferencing endpoints on the Connected Health network. The standard defines how display names and web addresses are constructed, supporting a shared directory of videoconferencing endpoints. Ministry of Health. 2015. 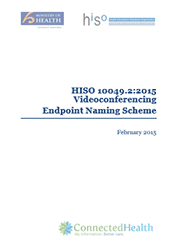 HISO 10049.2:2015 Videoconferencing Endpoint Naming Scheme. Wellington: Ministry of Health.